Thank you to everyone who came to the Rummage Show at the Workroom. I had a great time with lots of fun chatting and a bit of swapping. I did manage to sell lots of things and so it was a big success for me as I went home with a lot less than I brought even though I picked up lots of nice new craft supplies. Lately as the weather gets cooler I've been turning to the woolier crafts and my new interest is hand spinning. I had bought a drop spindle at a craft show but couldn't manage to spin with it. I picked it up again the other day and realized I should try Youtube for some more tips. I found a great tutorial by the spinning guru Abby Franquemont and that made all the difference. The big tip is to begin by trying the "park and draft" technique. 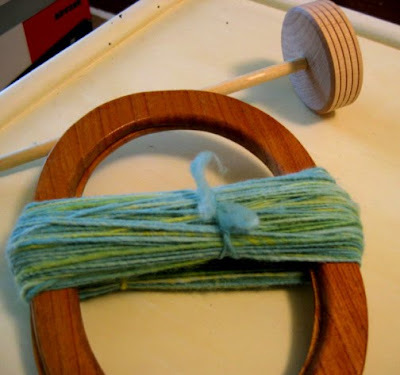 This means that you can "build up twist" in your yarn by spinning the spindle, then hold it between your knees so that it doesn't have a chance to spin backwards, then take your time "drafting" your roving. Drafting means pulling gently at the roving to thin it out to create the thickness of the yarn you want. It can take time to learn how to do this while keeping the spindle spinning, so "parking" the spindle gives you as much time as you want. While the yarn is building up twist you pinch it so that the twist doesn't travel up into your roving until you've finished drafting. I finally finished my first skein of yarn! 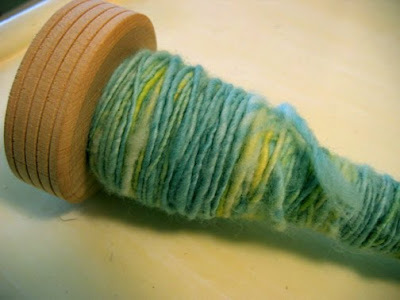 The picture at the top of this post is the yarn wound up on the spindle. 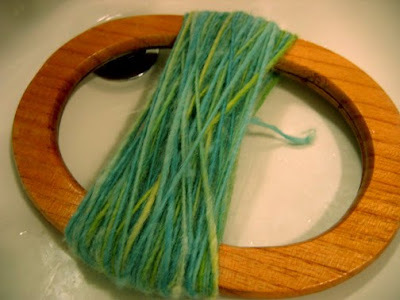 The picture below is the yarn transferred to a pair of wooden purse handles. I just had them lying around (they were up for offer at the Rummage Show and didn't sell, so that was lucky). 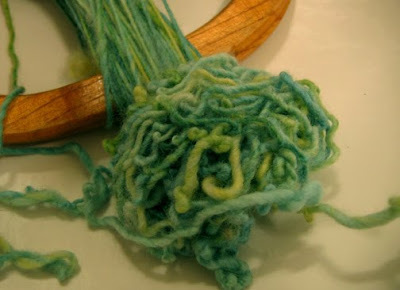 The main object is to keep the tension in the yarn so that it doesn't get all twisty. Then I "set the twist" by soaking the yarn for 10 minutes in hot water. After that I took the yarn off the handles thinking that it might dry quicker. But this was a mistake as the twists showed up again and the whole ball got all kinked up: So I carefully wound the yarn back onto the handles to dry: Seems ok now! It seems this stage is akin to blocking a hand knit sweater. Next post I'll show how my yarn turned out.